Pharmaceutical Executive just published a fascinating article by my friend Mason Tenaglia called Letting the Facts Get In the Way. Based on his firm’s analysis of various data sources, Mason provides a spirited defense of co-pay offset programs. He argues that co-pay cards don't increase utilization of higher-cost brand-name drugs and don't reduce generic usage, but do increase adherence. While the article lacks sufficient details to fully evaluate its empirical claims, it still makes a useful contribution by explaining how and why co-pay offset programs can be a valuable benefit management tool. 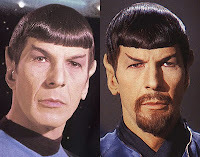 What do you think: good or evil? The article is a response to last November’s highly negative Pharmaceutical Care Management Association report, which claimed: “Copay coupons induce consumers to choose higher-cost brands (despite higher copays) over lower-cost competitors (despite lower copays).” See PBMs Launch a New Attack on Copay Cards. 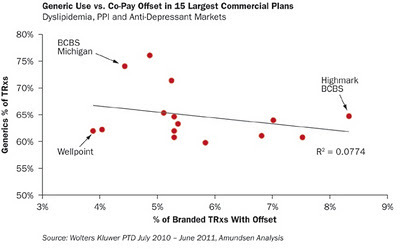 He also points to the lack of correlation between generic utilization and co-pay offset (per the chart below). 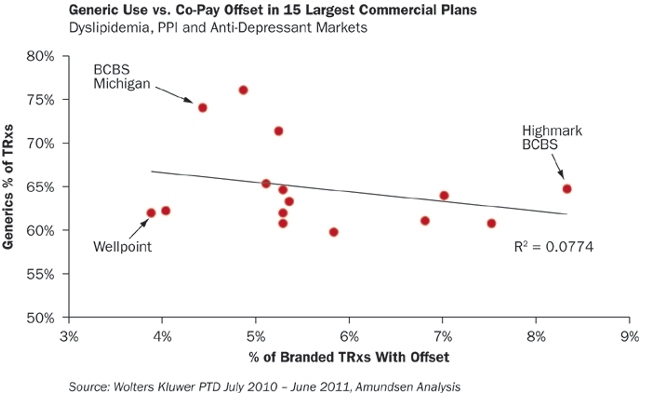 The last chart in the article summarizes a case study that shows increased patient adherence with co-pay offset. These data are consistent with peer-reviewed studies on the relationship between co-payment levels and abandonment. See Co-Payments and Prescription Abandonment. So, Drug Channels readers, what do you think about Mason's point of view? This is a complete crock of s***. It misses the point completely. The simple issue is that PBMs and Plan Sponsors offer lower copays on generics because they cost much less and are equally as effective as the brand equivalent. While it logically true that lower out of pocket costs improve adherence, the loser in that process is the Plan Sponsor. This is not a zero sum exercise in that this sleazy behavior does not improve adherence; rather it might not be any worse than if the generic was dispensed, but the result is sharply higher cost to the entity that pays for the drug, with no therapeutic benefit. The chart is very misleading because it compares generic % in a category. The real test is whether a copay card moves a patient to a brand from a therapeutically equivalent generic. The chart also includes PPI, so you have the Nexium problem, too. Bogus. 1- Free Market. If the drug companies want to pay it, what's wrong with that? Yes, the plan will pay more but doesn't that translate back into higher cost for both the employee and the employer, government, etc.? And won't they then pass those on? 2- Adherence. We continually silo medical costs from drug costs. This creates a "them or us" mentality. If adherence goes up this lowers overall all medical costs (studies abound proving this point). So an incrase in one (drug) is more than offset by the decrease in another (medical). 3- Profit. The argument is strictly profit. If doing it is wrong for the pharma companies (they want profit) then it is wrong for the PBM's and Dispensers to want to stop it (because they want more profit). Profit is anot a bad word but it can't be good for some an not for others. As a counter-counterpoint, see PCMA's 5 Questions for Brand Drug Copay Coupons Defenders. Big Trouble in the VA Contract: Who will win? Is Pfizer's Lipitor Strategy Working?